The restaurant industry is highly competitive. In the United States alone, restaurants are expected to earn nearly $800 billion a year. This intense competition also means that restaurants face a high failure rate. 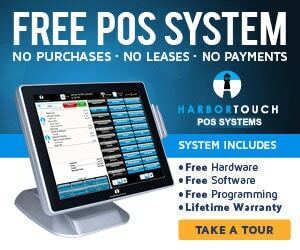 Almost 23% of all restaurants fail within their first year of business. According to a survey published by Kulture Konnect, restaurant marketing, along with menu options, guest experience, and brand differentiation are perhaps the four most significant challenges facing business owners in this industry. In the absence of a sustained marketing campaign, it is difficult to reach consumers on an ongoing basis. In an industry with high operational costs, the inability to increase footfalls can be disastrous. In the past few years, promoting your restaurant on Instagram has emerged as one of the top ways to market restaurant businesses. With over one billion monthly active users, Instagram is popular among consumers who love sharing visually-rich photos and videos – this includes photos that involve food and dining experience. A report published by the UK based Guardian points out that Instagram has fundamentally changed the way people eat. ‘Instafriendly’ restaurants today are a top draw among consumers who want to share pictures of the food they eat and restaurants they visit with their social media followers. Marketing on Instagram presents an opportunity for restaurants to capitalize. Here are few ideas that can help restaurant businesses maximize their Instagram exposure and draw new consumers to their business. Instagram users are surprisingly comfortable with the presence of business profiles on the platform. Studies show that over 80% of users follow at least one business profile on Instagram. More importantly, more than 200 million users visit a business profile every single day. Improving your restaurant’s presence on Instagram is thus a pivotal piece to your marketing puzzle. 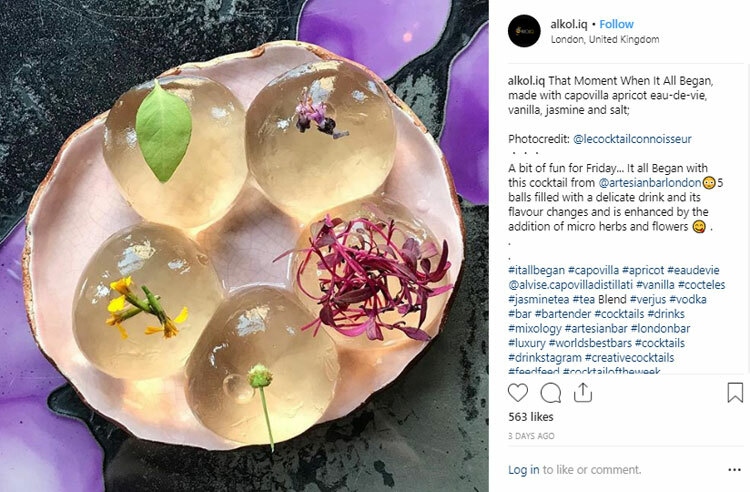 There are mainly three factors that help restaurants build visibility on Instagram – content, hashtags, and influencers. The first step to building a profitable Instagram marketing strategy is to invest in high-quality content for your Instagram page. It is a good idea to hire a professional food photographer to capture photos for your Instagram page. 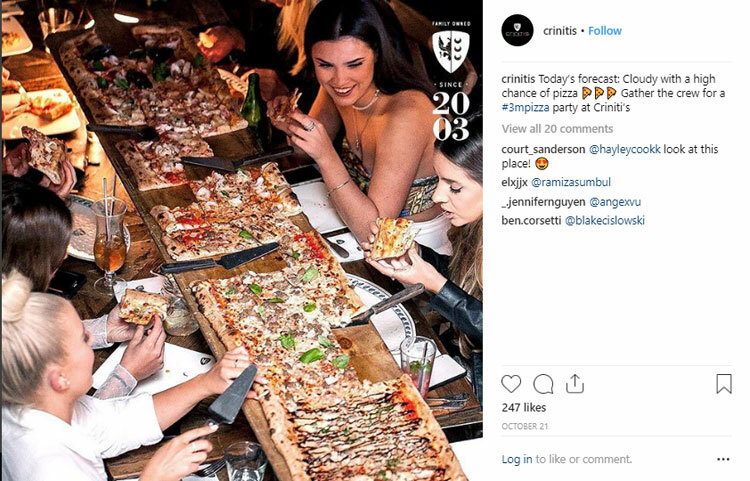 Criniti’s is a favorite Italian restaurant in Australia and photos of their pizzas and pasta get hundreds of likes every time they get posted. As you can see from some of their submissions below, these photos are professionally captured by a food photographer that helps with higher social media visibility. Acquiring an organic following on Instagram is quite challenging. One of the most effective ways to do this is with the help of hashtags. Using the right hashtags for your posts help them get discovered by users seeking such content on the platform. One study found that hashtags such as #happy, #food, and #amazing, garner the highest amount of likes for their submissions. Identifying such popular hashtags and using them in your posts can help with discovery and increasing your organic following. Finally, influencers play an essential part in the growth of your popularity on Instagram. Luckily, the platform has a vast user base of food lovers who routinely post pictures of food that they eat. A lot of prospective customers follows such influencers, and as a result, a positive referral from these users can go a long way in establishing your Instagram popularity. But finding the right influencer can be tricky. Although follower count is a good measure of a user’s popularity, that is not the sole criterion. From a restaurant marketers’ perspective, the following factors play a significant role – location, target audience, and likeability. An influencer with a relatively smaller following could be better for your business if they are from the same city or neighborhood as you. These users have a significant number of local people following them, and this helps with effective targeting. Also, a user with a targeted following of food lovers is more profitable than an influencer with a general audience. Finally, the likeability of a user is essential too. Target customers follow up on an influencer’s recommendation only if they like and trust their advice. Influencer partnerships do not always have to be a financial transaction. Sometimes, inviting an influencer to your restaurant for a tasting could be more than enough for them to share the love. Earlier in this article, I had pointed to a survey that listed ‘brand differentiation’ as a critical challenge facing restaurants. A well-executed branding strategy not only helps a restaurant differentiate themselves from others in the neighborhood but also creates a reason for guests to capture this on camera and share it with their Instagram friends. There are some different ways to do this. One of the most effective ways is to create aesthetically pleasing interiors that define your offering. 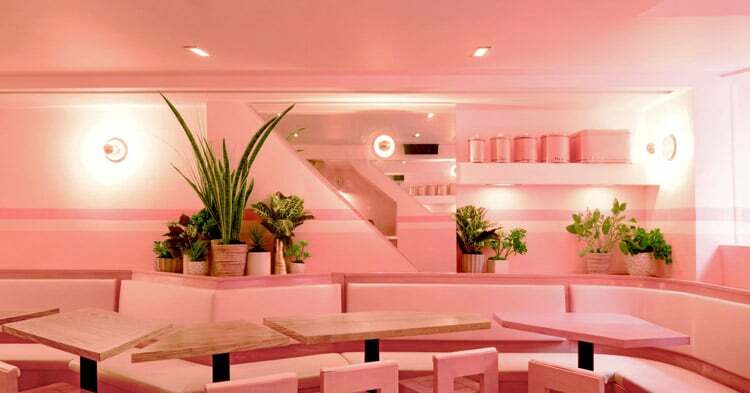 Pietro Nolita, an Italian restaurant in the heart of Manhattan differentiates itself with a distinctive pink interior that has found a fan following on Instagram. The restaurant now sees visitors from all over the world due to this unique differentiation. The items on your menu too play a significant role in defining your brand as well as maximizing Instagram exposure. One of the best examples of this is restaurants that invest in molecular gastronomy. These restaurants have seen an impressive spike in the Instagram following, thanks to photos published by guests to their Instagram accounts. Here above is an example of one such post on Instagram from a guest. Their photo of the food they ordered racked up over 500 likes within three days. Such posts help with building an impressive social media following for the restaurant that translates into paying customers. The restaurant industry is going through a transformative phase with an evolution in the way people order food, and the kind of food they want to order. Promoting and Marketing restaurants on Instagram provide restaurant owners a sneak peek into these emerging trends and also offers an opportunity to make the best use of this evolution.